If you want to create some very cool lighting effects in your home and you don’t care about changing colors, there’s a deal on Amazon right now that you definitely need to check out. 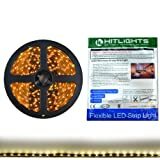 The nation’s top online retailers has HitLights Warm White LED Light Strips available today for just $7.99 each, which is a fantastic deal. Each strip is 16.4 feet long and is packed with 300 LED lights. You can cut them to any length you want, and the back has adhesive so you can stick them just about anywhere. Plug one into a Wi-Fi smart plug like this $10 model and you can even control your lights with Alexa or Google Assistant! SIMPLE AND EASY TO USE low voltage LED light strips for commercial and residential use – in living rooms shelving lighted cabinets toe-kicks and more! Reel is 16.4 feet in length. CUTTABLE AND CONNECTABLE – Compatible with our HitLights 8mm connector extensions and accessories. Simple connect – cut with a pair of scissors every two inches. DIMMABLE and FLEXIBLE these LED strips are great for a variety of indoor / interior uses including undercabinet lighting in kitchens ambient accent lighting in bedrooms lighting toe kicks in bathrooms or adding light to displays, book shelves, or china cabinets. SAY GOODBYE TO COMPLICATED INSTALLATIONS – Our kits install quickly and easily right out of the box no soldering electrical experience or tools required – and they last for years with minimal power requirements. HITLIGHTS QUALITY. Backed by a one year warranty from HitLights for peace of mind. Contact our US-based customer service team at any time for no-hassle troubleshooting and replacement or for any questions about purchasing or installation.